Twenty years ago this week I met the man of my dreams. I was just a wee little girl (Ok, I was a freshman in high school), so what I had back then was schoolgirl crush more than anything. The guy was older, so much older at age 19 then he will be when I'm 80 and he's 85. Luckily, we were both good kids and back then that meant that we kept our interest in each other to a little flirting in public, under the watchful eye of more people than we'll ever know. Our courtship was very seasonal. We saw each other at the county fair and then, perhaps, not for months. I went on to my high school things with friends, boyfriends and prom dates who weren't the legal drinking age. He went on to college, which included studying about farming, actual farming, watching basketball in Columbus, playing basketball behind the dorm in Columbus, eating at Wendy's--and not much else, actually. Eventually, FINALLY, according to many, I got to be college age and we began dating officially. 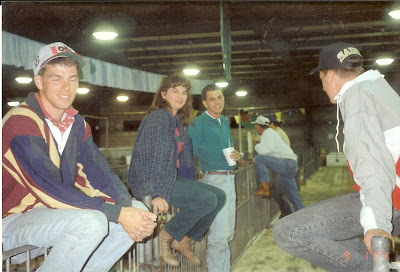 The photo above shows us in barn flirting mode circa 1994 under the watchful eye of my now island-dwelling brother and my future brother-in-law. I'm wearing his coat. Isn't he the cutest thing? Oh, and I just realized tonight in unearthing these photos that I was HOT. 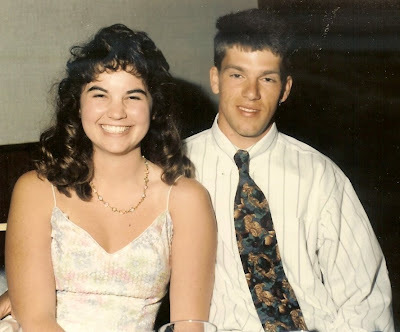 He looks a little dopey here at my sorority formal in 1993, but God, don't I look great (for a college girl in the early 90s). 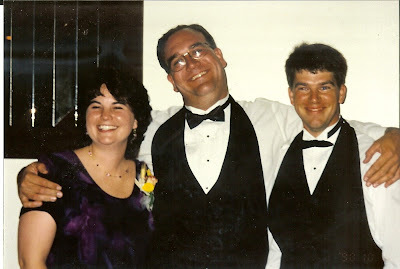 And we owe it all to this guy, John, who pulled each of us aside 20 years ago and said: There is someone you should meet. That's what he said to me, anyway. Maybe he told my future husband that I had Buckeye season tickets and owned a Wendy's franchise. Luckily, he liked me anyway. What am I doing here on the computer? The man of my dreams, just went to bed. In my house. Gotta go.